The Doctor of Physical Therapy students will be hosting a public injury clinic on October 1, 2016 at Roadrunner Sports. 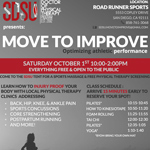 Come to the SDSU tent for a sports massage and free physical therapy screening. Learn how to injury-proof your body! Reserve your spot for any of the six free classes!